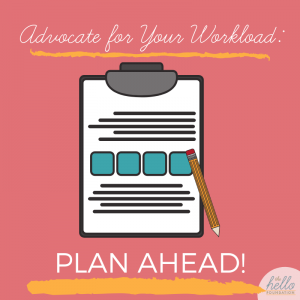 As a school-based SLP, there is lots to plan — the session this afternoon, the craft project and literacy center for next week, an evidence-based approach to therapy for the tricky student who’s still struggling, a plan of assessment for the for another student — lots of planning, and all needs to be done in advance! When I think about the planning I need to do, most of it is the minutiae of all the students on my caseload, the team members and projects I’ve committed to, and upcoming events, meetings, and trainings. If we’re not explicit about planning the workload we manage, the decisions get made without us. Rate yourself on a scale of 1-10. How have you managed your workload this year within the time allotted for it? You can give yourself a ten if you are meeting the expectations of the job with high quality, on-time work and you still have a little time leftover to work on extra projects or respond to unexpected needs that arise. If you are spending more time than expected on your work, or if your work is not getting completed on time, this is a good reason to plan for next year. Explain one-time factors. There are always unexpected factors that affect your day-to-day task list. I don’t know why there were three students this year with autism eligibilities from out of state! What was the deal with five new eligibilities in the kindergarten classroom? A reasonable plan for your workload has the flexibility to accommodate some of these unexpected events, but it is important to look for factors that signify real change. For example, a new IEP system, self-contained classrooms, special programs that are joining or leaving your caseload, or a significant change in enrollment. These are factors that might make this year’s workload difficult to compare to other years’. Pass the information on. Once you’ve carefully considered your own workload and how you’ve managed it this year, you might see some changes you can make to improve your own situation. If the changes are more administrative in nature (FTE, assigned responsibilities), you’ll need to look for the right person to give the information to, and the appropriate way to share it. Take the opportunity to talk about what you did this year to manage the issues that were in your control (I learned that new IEP system; I created and shared a procedure to manage kindergarten referrals), and suggest some ways to address the challenges not in your control (An additional half-day per week for SLP time at this school would allow assessments to be completed on time without canceling therapy for other students; Not attending weekly staff meetings would allow me to complete paperwork in a more timely manner.) Be ready to negotiate and be sure to communicate what will happen if nothing changes. If we stay head-down, doing the next thing on our list, we may not notice that our list is no longer appropriate for the time we have allotted. This is a recipe for over-work in the short-term, and burnout in the long run. Take the initiative now, in April, to plan and manage your own workload!